The U244-001-HDMI-R USB 2.0 to HDMI External Video Graphics Card Adapter displays video on an HDTV or HDMI-enabled monitor or projector via your computer or laptop's USB 2.0 port. You can extend video from your primary display to another, duplicate the same video on both displays or change the second display to your primary display. The adapter is an ideal tool for multitasking, viewing large spreadsheets, editing documents, giving presentations at trade shows or watching movies and playing games on large screens.You can add up to six U244-001-HDMI-R adapters, each attached to its own USB 2.0 port, to connect a total of seven displays to the video source. Adding or removing a monitor is easy - no need to reboot the system afterward. No external power supply is necessary. First, install the drivers using the included CD. Then, connect the adapter to the display and the source using an HDMI cable and the included USB 2.0 cable, respectively.The U244-001-HDMI-R supports high-definition video resolutions up to 1920 x 1080 (1080p) @ 60hz and features 128 MB DDR SDRAM of memory. Compatible with 32- and 64-bit Windows 7 and later, Windows 10. as well as 32- and 64-bit Intel Mac OS X 10.8.3 and later, Mac 10.11. The adapter also works with Surface tablets running Windows 8 Pro or later. 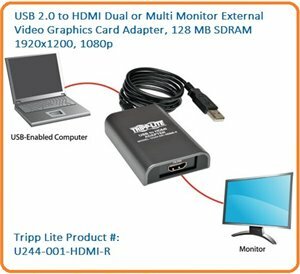 Enjoy superior video quality with Tripp Lite's U244-001-HDMI-R USB 2.0 to HDMI Adapter. The U244-001-HDMI-R displays video via a computer's USB port to an HDTV or HDMI-enabled monitor so users can multitask, give presentations, view large documents, watch multiple videos and even play games on a larger screen or from multiple screens. An additional projector or extra monitor can be added to a laptop or tower PC workstation by simply using a USB 2.0 port. With resolution support up to 1920 x 1200 (60Hz) and 1080p (60Hz), the U244-001-HDMI-R delivers vibrant video in every application. Up to 6 adapters can be used for 6 displays from a single computer. For peace of mind, the U244-001-HDMI-R comes with a three-year warranty and is RoHS-compliant. The U244-001-HDMI-R USB 2.0 to HDMI Adapter is an easy, inexpensive solution for converting video signals from a computer USB port to display on an HDTV or HDMI-enabled monitor. With one mini-USB female connector for a computer and one female HDMI connector for an HDTV or monitor, this hub is an ideal solution when you need to display video from a notebook computer for presentations, viewing video, gaming, and those other moments where only a large display will do. In case hooking up to an HDTV isn't enough, up to 6 adapters can be used at once for 6 additional displays from a single computer! If your computer has a female USB port, then the U244-001-HDMI-R will work with it. For ultimate flexibility, the U244-001-HDMI-R is compatible with Windows 2000™ and later, and Mac OS® X 10.4 and later operating systems. The U244-001-HDMI-R also supports Microsoft Surface Pro tablets running Windows 8 Pro and Surface Pro 2 tablets running Windows 8.1 Pro. With no external power supply, the U244-001-HDMI-R is ready to go out of the box: simply install the drivers, connect the adapter to your computer's USB port and connect the additional HDTV or HDMI-enabled monitor for the extra display to work with your computer. The U244-001-HDMI-R is backed by a three-year warranty. As part of Tripp Lite's commitment to environmental responsibility, the U244-001-HDMI-R is manufactured in compliance with strict RoHS specifications. Compatible with Windows XP, Vista, 7, 8, and 8.1. Supports both 32- and 64-bit. Compatible with Intel Mac OS X 10.8 (10.8.3 and later), 10.9 and 10.10 (Mac OS X 10.9 and 10.10 is limited to a single add-on monitor. See driver Release Notes for details) Supports both 32- and 64-bit.